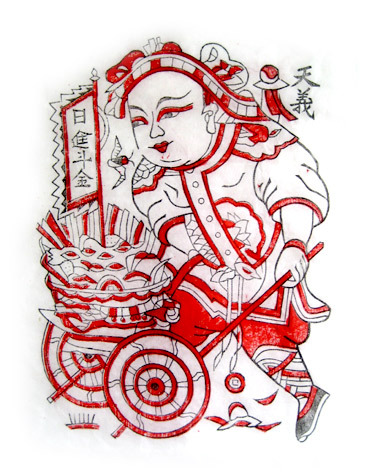 An old funtion of Chinese woodblock printing was the production of the new-year prints nien-hua. People used to buy these prints each new year and paste them to doors, walls and windows. They show symbols, gods, heros and figures from legends and operas. They bring blessings like luck, prosperity and babies. They also are considered to inspire children to good behaviour and national pride. The prints differ in their meaning. 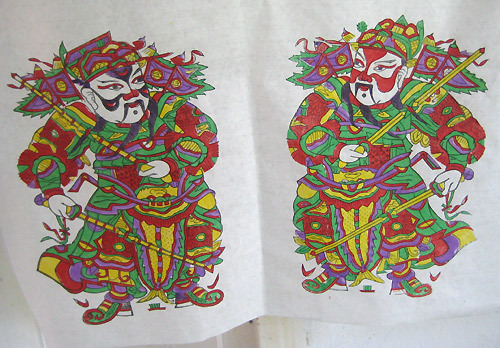 Usually, most important was a print showing a pair of heroes pasted to the outer door, men-shen, and the image of the kitchen god pasted above the stove. Other prints were pasted in rooms where people met, less in sleeping rooms. Also, there were prints for special purposes, like the wish for babies by young women. 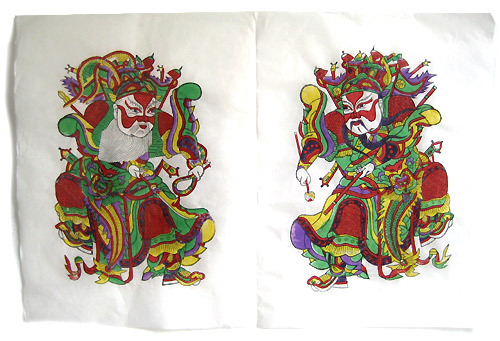 Printed new-years images emerged for the first time during the Song Period in the 11th Century (maybe even earlier, as they were linked to calendar prints, which already appeared during the Tang Period, both being products for sale at New Year). In the beginning, the prints were just black and white, later hand-coloured, and from the mid 17th Century being printed from several colour blocks. The archaic and very graphic appearing motives thus are very old and kept on being copied for several centuries. In the beginning 20th Century lithography was introduced from the West and started to displace woodblock printmaking. 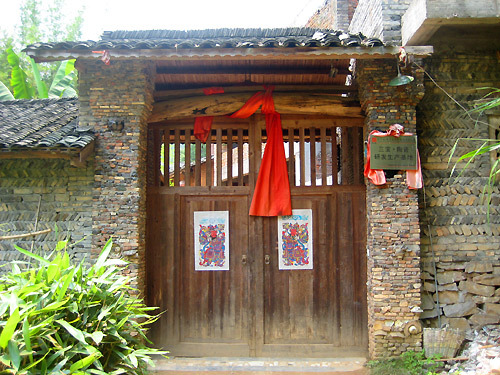 During the Cultural Revolution, many old blocks got destroyed. Today these prints are also done by screen printing. Printing by hand from woodblocks is decreasing. Due to different materials today, some colours have changed. The prints are less pasted to doors and walls, but popular among academics and artists, they are collected or bought as gifts and hung in frames. Here I present the prints and the method of woodblock print master Zhang Jing Xu from Zhu Xian in Hunan. He is working for 40 years now, as the fourth generation of the Tian Yi De School ("sky, good friendship, power"), which his son will continue as the fifth generation. 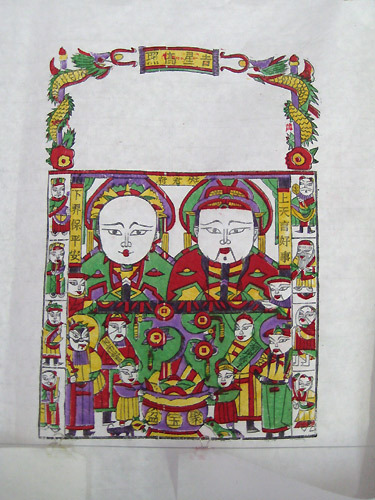 This print shows the brothers Guan Sheng und Guang Yu. Guang Yu was a general serving the later King Liu Bei during the late East-Han Period, during the change to the Period of the Three Kingdoms, San Guo. He contributed much to the victory of the country Shu. Due to his loyality and bravery he was admired like a god in later years. 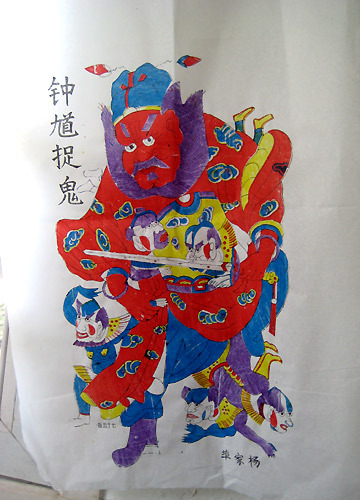 He is still very popolar and is considered to bring safety and prosperity. This is an image from the Tang Period (618 - 906) and shows Zhong Kui, who participated in the National Test for Officials with best results but was disliked by the Emperor due to his ugliness. When he committed suicide, god felt mercy for him and made him the Official responsible for hunting ghosts. The small figures in the print are his ghost servants. This print from the Tang Period (618 - 906) tells the legend of the birth of new-year's door-prints. 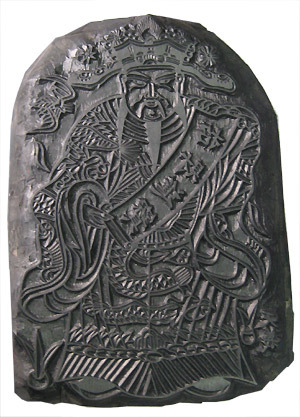 It shows the very popular generals Qin Qiong from Shandong and Jing De from Shanxi. As guards, they stood each night in front of Emperor Li Shi Min's sleeping room. As they were unhappy because of the lack of sleep, the Emperor finally hang two images of them onto his door. 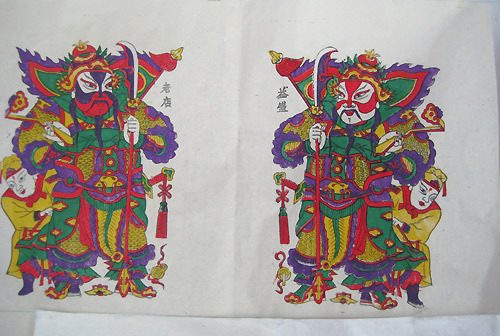 This print shows the two generals Zhao Kuang Ying (left) und Yang Gun. During a fight, Yang Gun pushed his opponent from his horse. Suddenly he had a premonition that this man would be the new Emperor, and he decided not to kill him. Instead he exchanged his heavy copper weapon for Zhao Kuang Ying's valueable belt. Later, Zhao Kuang Ying became as the new Emperor the founder of the Sung Period, and Yang Gun became his general. This image is showing the kitchen god. Wooden blocks from pear are used from both sides. Out lines are cut with a pointed line knife. The remaining wood is removed exclusively with flat chisels, along the wood grain, with the help of a mallet. For registering, all papers are fixed between two wooden bars in a gadget which allows to rotate them. This way, all papers are fixed in the same distance to the block. The block is brought to the same height as the papers. With the hand, the block's position is felt through the paper, moved to the right position and fixed with pieces of folded paper. Inking the block is done with a huge brush. 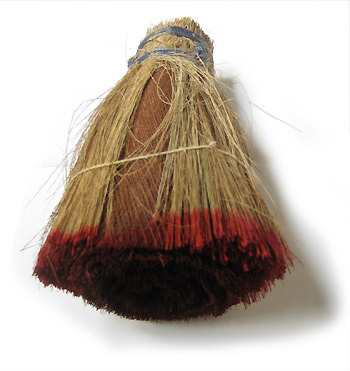 This brush is mainly made by palm fibres, covered by a layer of grass fibres. It can be used for about a year. Inks are made from secretly kept recipies, but today also chemical inks are used. Printing is done with a rubbing tool made by palm fibred, stretched over a wooden kernel. These fibres have to be replaced after ten days of use. When the block is inked, the next paper is pulled firmly over the block, rubbed, and pulled over the already printed sheets. This way, up to 100 papers can be printed. I thank Zhang Jing Xu and his son.